I should have known this wasn’t going to end well. There were no allergy incidents to speak of, but that has more to do with the fact that I didn’t eat out at a restaurant once in the week I was there. 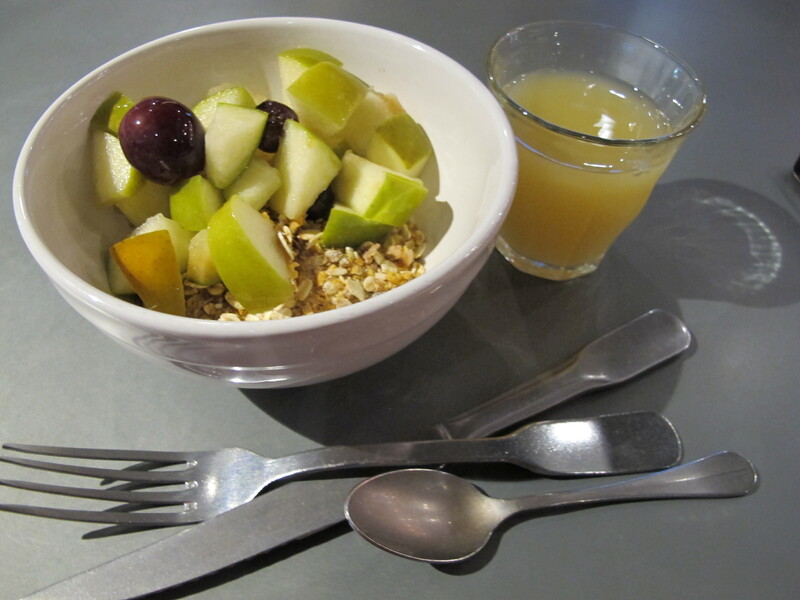 Breakfasts were fairly straight forward. I ate at the hotel’s buffet. Believe it or not, in a place that is so renowned for its pastries, getting gluten free cereal and bread was actually quite easy. I ended up grabbing a bowl of gluten free museli topped with fresh fruit salad for breakfast every morning. I found the museli to be tooth achingly sugary, but it was edible. And given the lack of alternative options, I ate it. There was no fridge in my room to keep anything that I could have bought from the grocery store cool overnight. My hotel room was tiny, and effectively consisted of nothing more than a bed and bathroom. Speaking of grocery stores, they ended up saving me. Although morning tea, lunch, and afternoon tea were provided at the conference that I was attending, it didn’t take more than 10 seconds on the first day for me to realise that I literally couldn’t eat any of it. 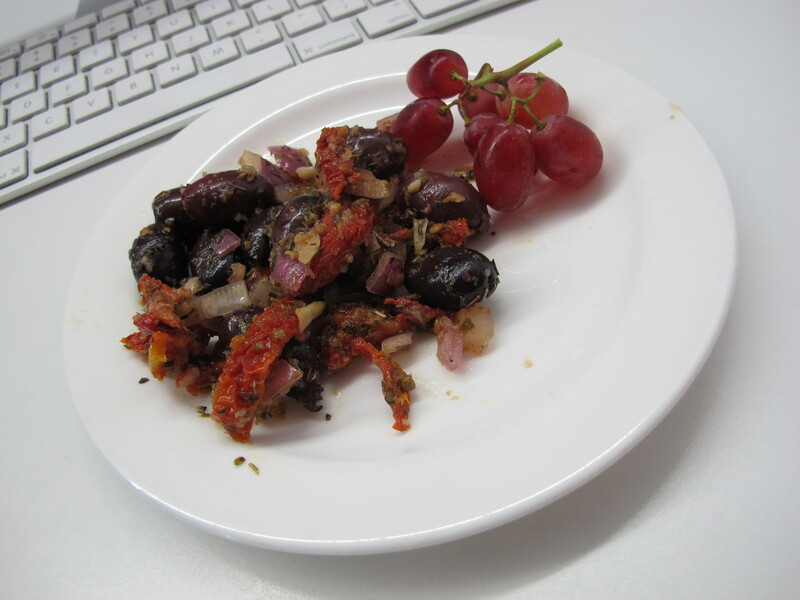 Lunch? Bread rolls loaded with butter, cheese, and meat. By lunchtime on the first day of the conference, I’d realised I would have to provide my own food. I did inform the conference organisers of my dietary requirements on the appropriate place on the registration form – apparently not worth the paper it’s written on. I’m not surprised – this is by no means the first time it’s happened to me. Thankfully there was a supermarket across the road from the conference centre in town. I bought lunch there every day, and just had to bypass the morning and afternoon tea pastries. The only thing I got from conference catering was coffee. 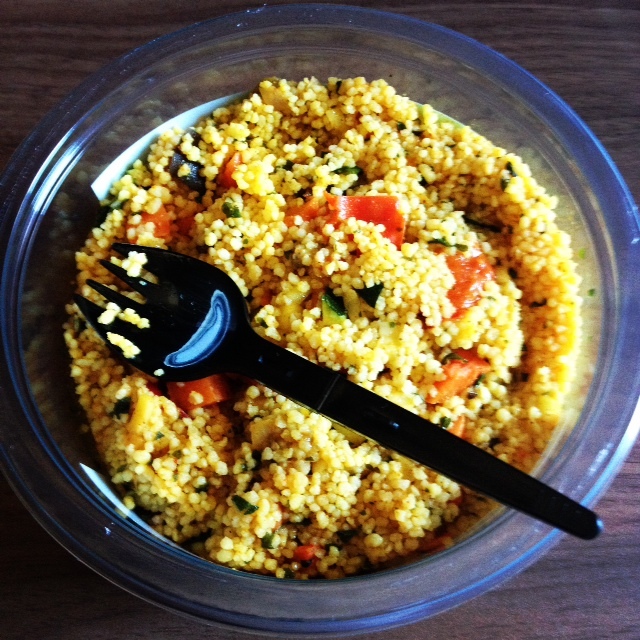 A tub of cold Moroccan style cous cous with vegetables from the supermarket. I ate similar things for both lunch and dinner. With lunch sorted, it was then time for dinner. After multiple attempts to find anywhere that could do vegan food, I was just about ready to give up and simply ask for something that was dairy free, and eat the meat – I figured my body could tolerate it for a week even if my doctor would want to shoot me when I got home. And? No. We literally couldn’t find anywhere that could do me a dairy free meal. Butter was used in everything they cooked. That first night, I went without dinner, because all the shops had closed by that point, and I had no way to buy my own food until the following day. Dessert? Kind of depressing seeing as I was in France. In the land of quiche Lorraine, I had naturally assumed dairy and egg would play a big part in the diet in Nancy. However, despite my fairly extensive Google research before leaving home to see where I could go out to eat, I had little success. The places that people talk about online as being veg*n friendly do vegetarian food. That was available everywhere. But vegan? Not so much. As a business traveller, this disappoints me. I was unable to go out in the evenings and network with my colleagues from the conference over dinner because I couldn’t eat the food. Unimpressed, but at the end of the day, there’s little that I can do about it. When you have to travel for work, you don’t get a whole lot of say in where you go. You simply have to deal with the hand you’re dealt in some capacity. I found a way around the lack of vegan options in restaurants and cafes by buying my own food at the grocery store, but make no mistake, I was certainly glad to be out of there once the conference was done. 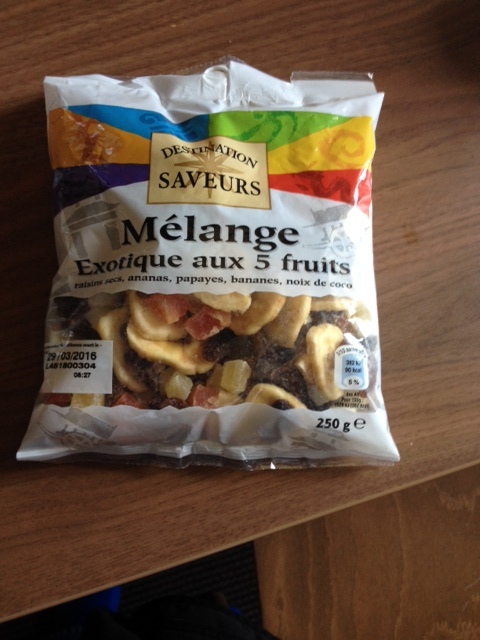 In a foodie destination, and I had to resort to pre-packaged supermarket food. Classy. This trip was pretty much an unmitigated disaster, and it had little to do with the food. Our flight to Chuuk got diverted, and a series of unfortunate events followed, meaning I was stuck in Pohnpei for several days before I could even get to Chuuk. This cut a 7 day trip to effectively 3 and a half days. Not impressed. United can pretty much stick it where the sun don’t shine. The travel insurance claim is in to try and get some money back, so we’ll see what happens. Anyway, as already posted, none of the flights to and from Chuuk had a VGML on offer – I was simply given the same snack box as everyone else. 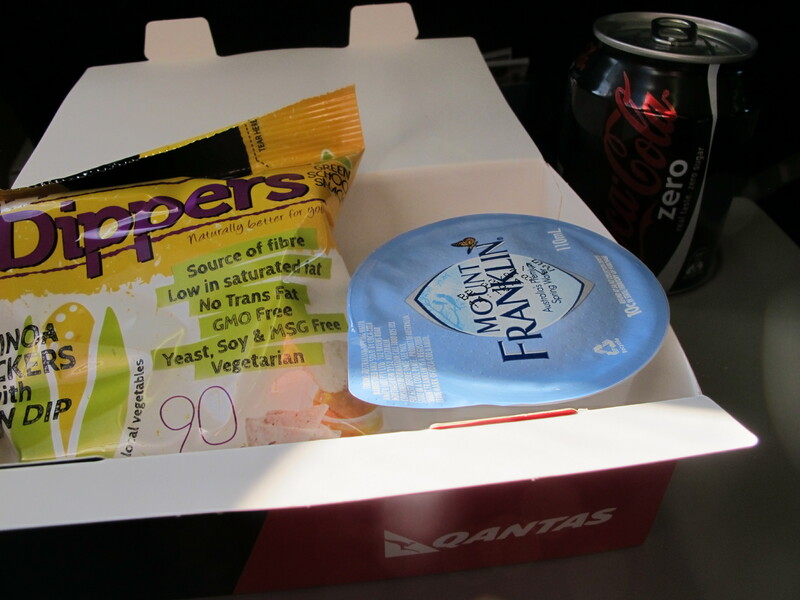 I did my best to bring my own food on board to eat, and that was that. In Chuuk, one has to realise that it’s very much third world. Out of all of the island states that make up the Federated States of Micronesia, it is widely accepted that Chuuk is the least developed. Additionally, Chuuk was hit by typhoon Maysak at the end of March, and that decimated the local food crops. So at the resort, fresh fruit and veg was in short supply. A problem when you’re vegan. At breakfast, I ordered the fruit plate, and all that came was a couple of very small slices of watermelon. They literally had no other fruit. And there was nothing else on the breakfast menu that I could eat. Lunch and dinner effectively had the same menu. There were, believe it or not, a couple of vegan options on the menu. However, as previously noted, the island had no fresh fruit or veg due to the typhoon…As such, I was basically limited to one dish: soba noodles with stir fried vegetables. Which was fine – until they ran out of vegetables too. I kid you not. 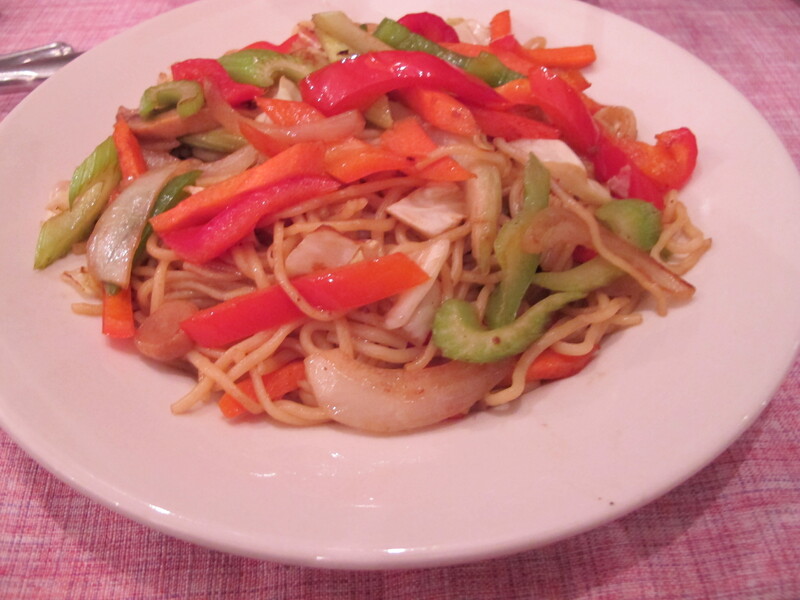 The vegan option at the resort in Chuuk…Soba noodles and vegetables. Ultimately I resorted to potato fries and rice for lunch and dinner. Ever tried diving while your stomach is full of heavy starchy carbs? Not a pleasant experience. For the record, most other guests were eating fish and rice, or fish and chips for every meal. Thankfully I only had to deal with the food for a few days due to the flight issues with United which meant the trip was cut short. I had other issues with the resort messing me around with my bill and whatnot as well. This is obviously by no means my first time travelling to a developing country, but it’s probably been one of the more frustrating experiences I’ve had, which is saying a lot. I’m in two minds about whether to return. On the one hand, I’d like to actually go and see some of the wrecks I’d planned to dive in the first place but didn’t have time to due to the flight disaster (I dived a few, but nowhere near what had been planned). On the other hand, I really don’t want to have to deal with United again, nor do I want to have to put up with the lack of food options (particularly on an active dive trip), or the issues that I had with the resort. What should have been a once in a lifetime experience to dive the wrecks of Chuuk Lagoon was pretty much one disappointment after another. Nearly home…After waiting around outside the terminal for about 4 hours for the building to reopen, we finally got inside around 3.30am. However, Qantas check-in desks didn’t open until 4am. Seriously, I know Cairns isn’t a huge port, but it’s atrocious that the airport terminal building isn’t open 24/7, even if check-in isn’t. At that point, I’d already checked in online on my phone and just needed to bag drop. Eventually did that and headed upstairs to the Qantas lounge. It’s usually quite quiet in the mornings in Cairns, but for some reason, the place was full of loudmouthed bogans. Imagine my joy? Eventually headed off to get the flight, which was running on time. Given that it’s the first flight of the day, you’d hope it was on time! At the gate, the scanner wasn’t working – because of course it wasn’t. They had to manually check everyone in at the gate. 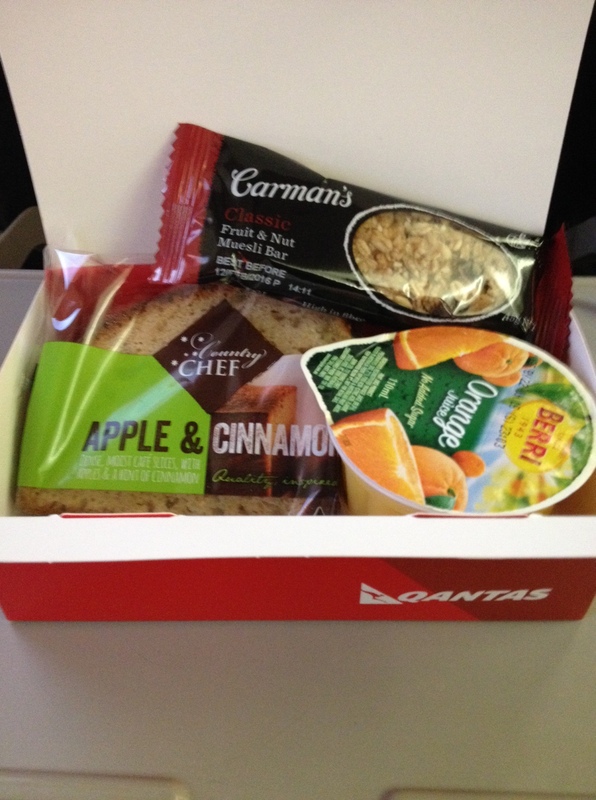 We did depart on time, and once in the air were served our typical bunny hop snack box. Last time I took this flight, we got some fruit, so I was hopeful, but not holding my breath. Apple and cinnamon bread, a museli bar, and orange juice. Nothing edible, but I did get a coffee. We landed on time, I got my bags, and headed for the taxi rank. The second I walked in the door at home, I stuffed my face with a box of raw food bars. Seriously. I was starving. Thus ends my aborted holiday to Chuuk. Back to work again. Bowen is this little coastal town in North Queensland, known primarily for its mangoes. No, I’m not going to lie, that really is about all it’s known for. But I recently had to do a roadtrip there for something work related. Imagine my joy – tiny little town in North Queensland where 90% of the menu is “steak” or “seafood”. However, having travelled in North Queensland in the past, I knew to come prepared. I stocked up with my own food. Dried fruit, nuts, raw food bars, bread, vege spread (gluten free Vegemite), etc. Unsurprisingly it was all gone in 48 hours. Me and the person I was travelling with did attempt to eat out at one of the local pubs one night. I would not call it a resounding success. Their salads came pre-dressed, their fries came pre-seasoned, they had gluten free bread, but it had egg in it, and literally every other meal had meat in it. However, I did suspect that this may be the case, so I had snuck in some food into my handbag before we went out. I ended up ordering the Turkish bread and trio of dips from the menu. 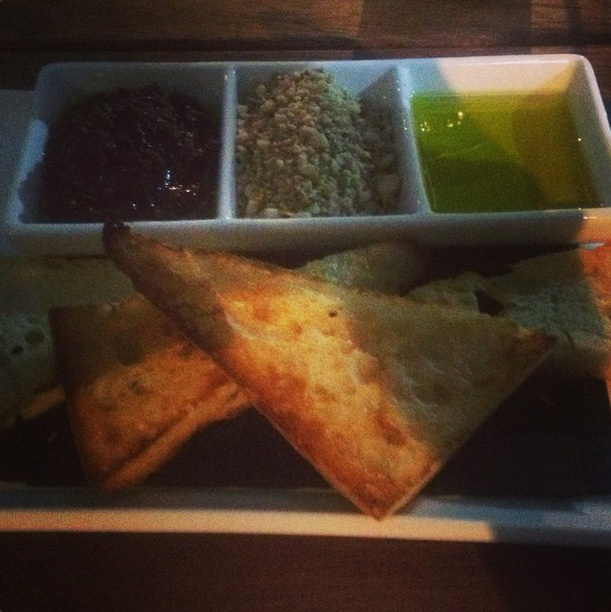 Obviously I couldn’t eat the Turkish bread, but the dips were straight forward: olive, evoo, dukkah. They were all vegan and gluten free, just the bread wasn’t. So, because I’d been genius enough to bring my own bread, I was set. The Turkish bread and dips, where I ended up eating my own bread. Yes, I do find it totally ridiculous that it’s necessary to bring my own food like that. It’s an ongoing problem with travel to small regional towns. While the food they serve in these pubs can be healthy (I can see your surprise at that comment from here! ), there are very limited options if you’re vegetarian, let alone if you’re vegan or gluten intolerant. Having spent quite some time in North Queensland in the past, I’m aware enough of the situation. However for interstate or overseas visitors, I can see how this could potentially be an issue if you’re not prepared for it. The shops have limited opening hours, so if you’ve not stocked up in advance and you arrive when the grocery store is closed? Sorry, but you might be going hungry? I’m not saying these places need to cater to every single dietary restriction on the planet, obviously that’s not going to happen. But is it too much to ask that they don’t pre-make all the salads with dressing? I might have medical issues, but there’s plenty of others out there who just want their dressing on the side, allowing them to choose how much to use, so their salad isn’t drowning in it. They had a Thai beef salad on their menu, and I could have eaten the salad if they hadn’t pre-mixed in the beef and the dressing. It was a little frustrating dealing with the attitude there when I asked about ingredients, but food aside, it was a fun road trip 🙂 Pretty little town!